Somehow, last November, I missed a race. 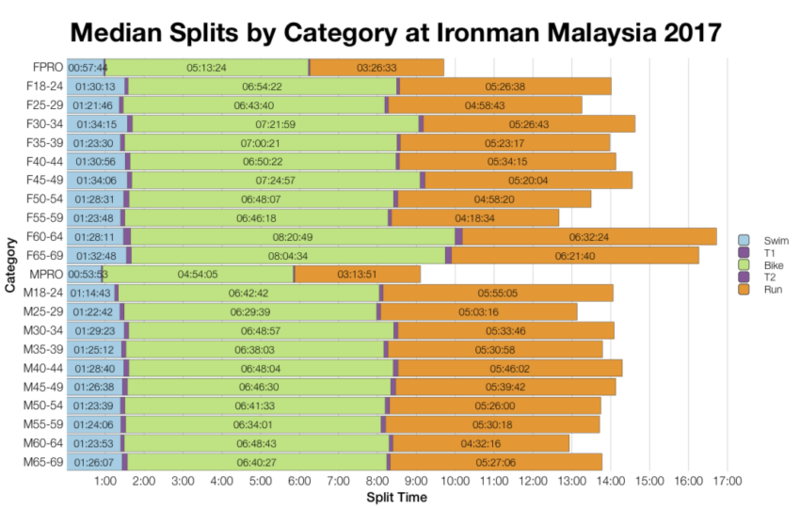 Ironman Malaysia slipped me by, and it doesn’t appear anyone racing at the time came looking for my stats either. Now that I’ve been alerted to the oversight, I’m going to quickly fill the gap with a heavily delayed analysis of the 2017 results. 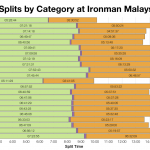 Ironman Malaysia is a relatively small race of around 1,000 competitors with a decent 50 Koan slots on offer. It’s not a particularly fast course, but one that challenges with hot and humid conditions. The 2017 race trends faster than the amalgamated results from the previous years. this mostly comes from the run section where we see the biggest change in results, but swimming and bike also trend slightly faster. Overall it’s not a huge shift in performances though. The DNF numbers for the 2017 race lie at the low end of the range. It looks to have been a good year for racing on the course. 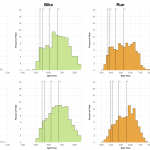 Medians trend similarly to the distributions with runs coming out a little faster in many age groups. 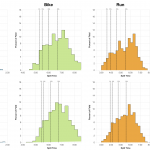 Given the size of the race and relatively small sizes of some divisions there’s a lot more variability in age group medians than we see for bigger races. The majority of athletes are from within the Asia-Pacific region, but Kona slots tend to spread out among competitor nations with Japan taking the most on this course. 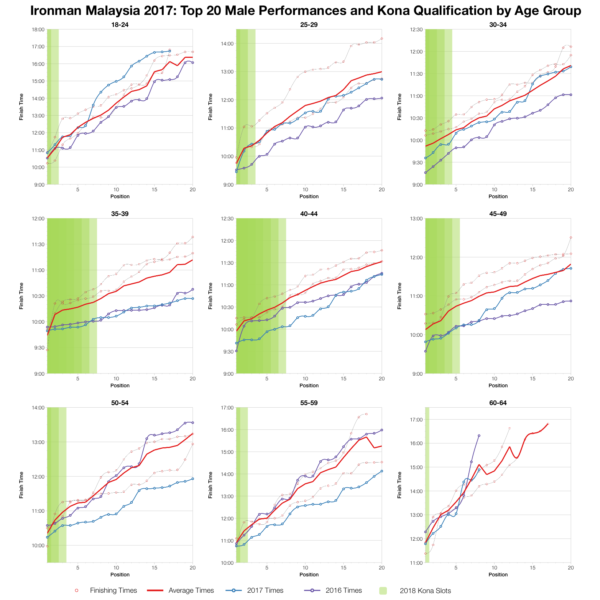 Tracking the age group times for different positions shows that 2017 was faster in many cases, but rarely by very much. so although it does appear to have trended faster it certainly wasn’t a huge change in performances. 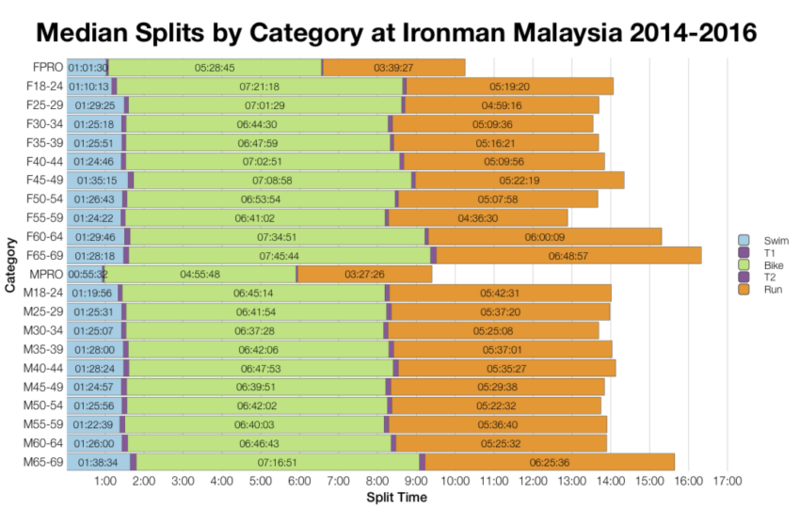 Based on the start numbers I’ve estimated the slot allocation and automatic qualifying times for Ironman Malaysia. final numbers may vary and roll down isn’t factored into this chart. You can find more details of Kona qualifying times on my Kona qualification page. 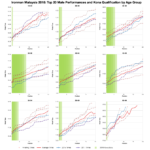 The top twenty for each age group varied in performance. Mostly times were average or better for the course. In some instance times were course bests for those age group positions, but in many fo the biggest age groups they were very similar to the previous year. 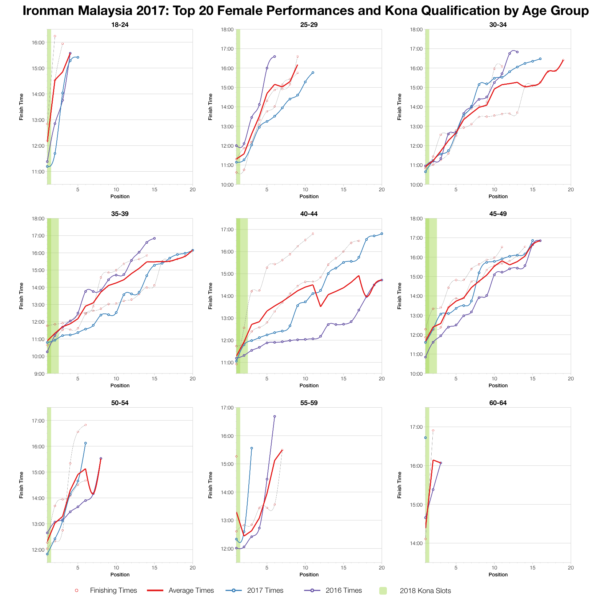 You can access a spreadsheet of the full results from Ironman Malaysia 2017 on my Google Drive.